The owl is a bird that has often been synonymous with mystery, being interpreted as a harbinger of good luck or of doom, depending upon the culture prevailing in the region where the bird lived. Scientists from all over the world have endeavored to identify and classify these elusive animals. The number of owl breeds has kept changing over the years as new species are discovered and some have disappeared. Is There an Accurate Number of Owl Species? According to “Owls – A Guide to the Owls of the World,” by Konig, Weick and Becking, in which these birds were identified, counted and reclassified in a meticulous and exhaustive manner, the number closed at 212 species worldwide. After the book was published, between 1992 and the present, the latest news has it that five more species have been identified. This brings the total number of owl species to 217. Owls belong to the zoological class of Aves, Strigiformes. This order is subdivided into two families: the Strigidae, or typical owls, and the Tytonidae, or barn owls. The chief physical characteristics of the Strigidae family are large, rounded heads, strong hooked beaks, round facial discs of feathers, front-facing eyes, dense feather coverage, stocky bodies, camouflaging color feathers and strong feet with razor-sharp talons. Their size varies from 4.7 inches to 29.5 inches (12-75 cms tall), and they weigh from 1.4 ounces to 148 ounces (40 gms-4.2 kgs). Chief physical characteristics of the owls that belong to the Tytonidae family are long, compressed bills and long legs in comparison to their tails. In addition, the facial disk of feathers is heart-shaped, and there are no "ear" tufts. Their eyes are small and oval-shaped, and their hearing powers are superb. 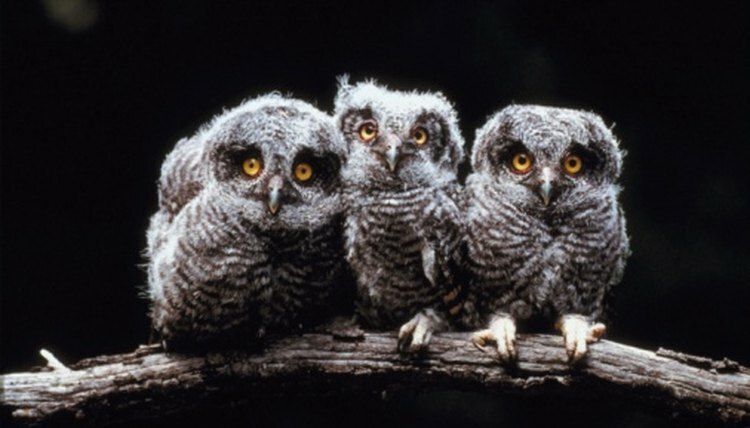 Research shows that owls belonging to this family can locate and catch prey based on sound alone. The middle claw looks and behaves like a “comb claw”: It is serrated, and the owls use it for preening. The color of these owls is often brown-gray on the back, with a light, contrasting belly. Their size varies from 9 inches to 22.4 inches (23 cms–57 cms), and their weight, from 6.6 ounces to 2.8 pounds (187 gms–1.3 kgs). There are 23 genera in this family, which is composed of 194 species. They live all over the world, with the exception of Antarctica. One genus, Bubo, contains species such as the American horned owls. Some other common species names in the Strigidae family of owls include the cape-eagle owl, crested owl, brown fish owl, spectacled owl, Malay fish owl, hawk owl, barking owl, bare-legged owl, spotted little owl, fearful owl and Jamaican owl, among others. More than one-third of the world’s total number of owls belongs to the Otus genus of this family. Some examples of the Otus genus owls are white-fronted scops owl, Indian scops owl, bare-legged scops owl, elegant scops owl, spotted scops owl and, striated scops owl. There are two genera in the Tytonidae family: the Phodilus and the Tyto. Eighteen species of owls are in this family, 17 belonging to the Tyto genus and only one to the Phodilus genus. The 17 species in the Tyto genus are the greater sooty owl, lesser sooty owl, Minahassa barn owl, Taliabu masked owl, lesser masked owl, Manus masked owl, New Britain barn owl, Australian masked owl, Tasmanian masked owl, Celebes barn owl, Soumagnes grass owl, common barn owl, Andaman barn owl, ashy-faced owl, African grass owl, Eastern grass owl and Congo bay owl. The Phodilus genus has only one species – the Oriental bay owl. The five new species have not been included in this count yet.